You’re reading an article by Jay Robinson, a designer living in California. 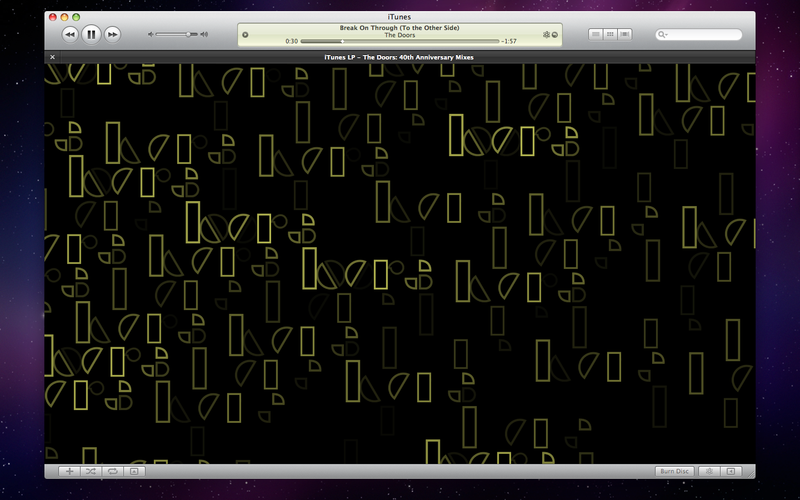 It’s clear that I’m pretty excited about iTunes LP. The “deluxe album” for­mat from the iTunes Store is an attempt to revi­tal­ize music sales by pro­vid­ing an immer­sive dig­i­tal expe­ri­ence com­plete with detailed art rem­i­nis­cent of when peo­ple used to buy records. 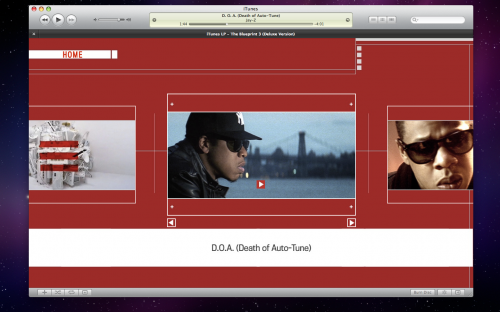 Feature-wise, an iTunes LP is a DRM–free album in high-quality 256kbps AAC for­mat, along with dig­i­tal extras (visualizer(s), pho­tos, videos and inter­views) wrapped in a cus­tom WebKit-powered site. This morn­ing I bought Jay-Z’s Blue­print 3, as well as The Doors iTunes LP, and am very impressed. Below I’ve included some screen­shots as well as my thoughts on the experience. When you pur­chase an iTunes LP, the music files begin down­load­ing fol­lowed by an addi­tional (hefty) file with an “.ITLP” exten­sion. The .ITLP file itself can be over 500MB. 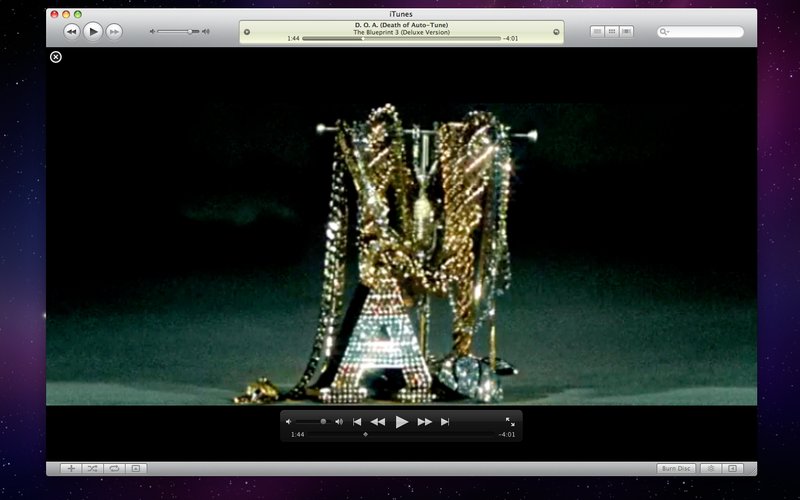 Once you double-click an iTunes LP in iTunes, it takes over your entire win­dow with a WebKit view. A photo fades in and an audio snip­pet rep­re­sen­ta­tive of the album will start to play (about 30 sec­onds). 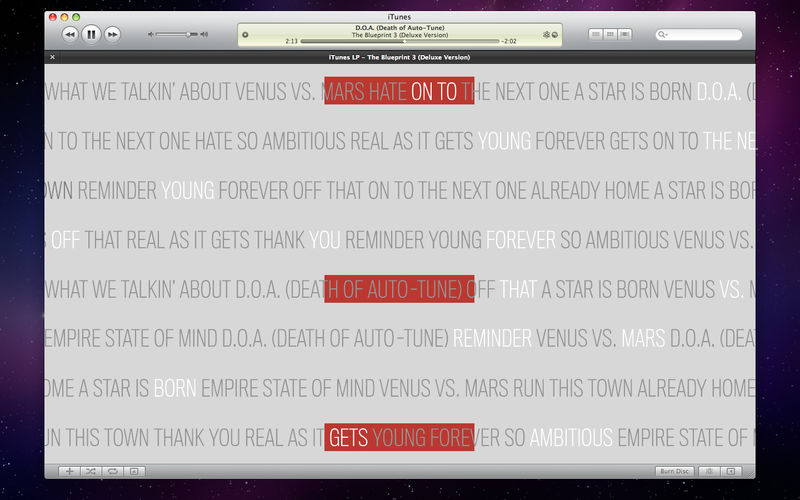 A list of links leads you to the most obvi­ous fea­ture of the iTunes LP: pho­tos, videos and lyric views. Hover for alter­nate image. Click for full-size. A won­der­ful thing hap­pens when you click “Play All” on an iTunes LP — you are treated to a fea­ture I dub iTunes LP visu­al­izer. 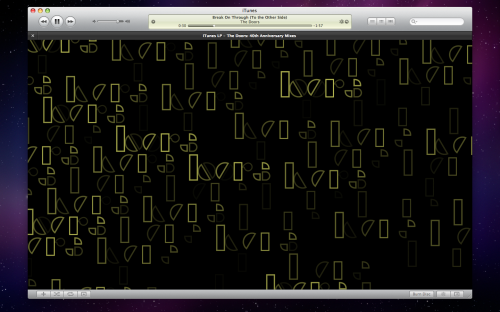 The visu­al­izer is the “sur­prise and delight” fea­ture of iTunes LP; a cre­ative dis­play of dig­i­tal art. 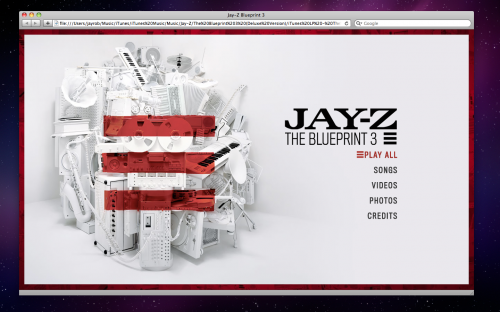 Jay-Z’s iTunes LP album comes with three dif­fer­ent visu­al­iz­ers that cycle through at mea­sured inter­vals. 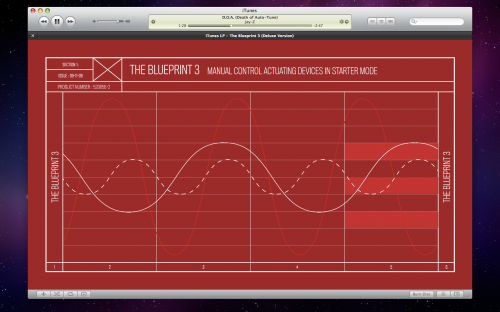 The ini­tial visu­al­izer shows audio wave­forms. I mis­tak­enly thought the wave­forms were dynam­i­cally gen­er­ated by the music until I watched for a while. Here are the screen­shots of the three visu­al­iz­ers, respec­tively called “Waves”, “Songlist”, and “Puzzle”. Hover for alter­nate image. Click to see full-size. 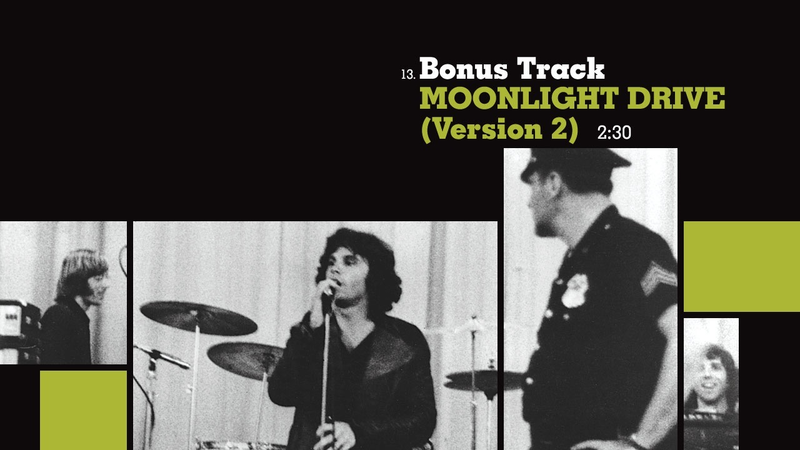 I’ve also included the only visu­al­izer from The Doors album. 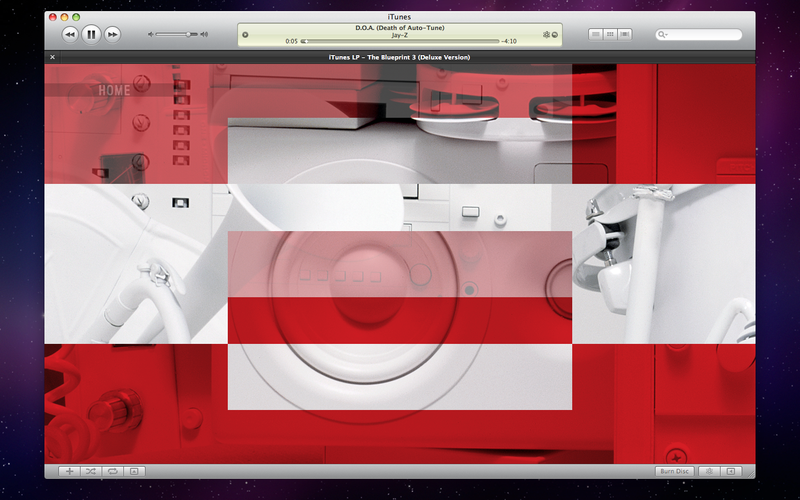 How­ever, lis­ten­ing to music in the iTunes LP intro­duces some unfor­tu­nate user inter­face prob­lems. 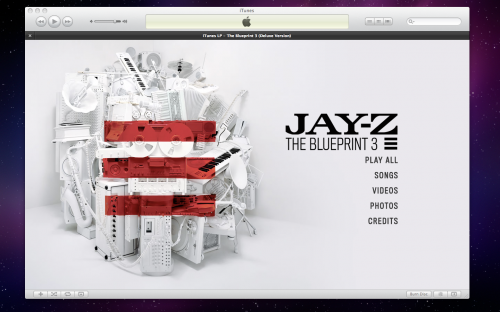 Sim­i­lar to Genius Mixes (also new in iTunes 9) there is no way to ask iTunes to send you to the cur­rently play­ing song. 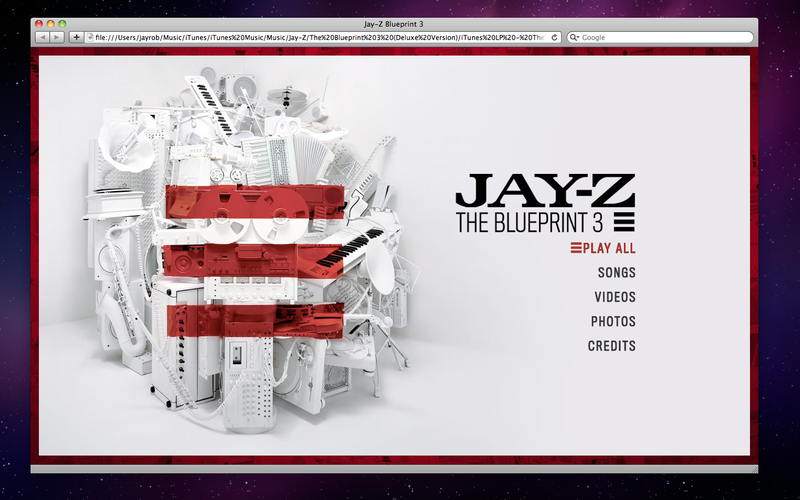 This means that unless you leave the LP view you can­not rate the song or view any other metadata. This also causes a prob­lem if you leave the iTunes LP inter­face to browse your library, then want to return to the LP. The only way is to select the iTunes LP from your file list­ing and double-click. 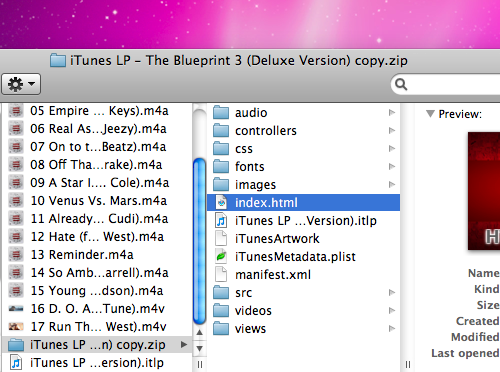 This results in the iTunes LP site load­ing from the start and you los­ing your place through the album. For­tu­nately, the usabil­ity issue does not cause con­flicts with the Play Count, which func­tions as expected. The iTunes LP expe­ri­ence is accom­plished with HTML 4.01, CSS and JS. The inter­face feels very Flash-like, but there is no trace of it. The CSS ani­ma­tions are elab­o­rate and smooth. Font files are ref­er­enced with an @font-face dec­la­ra­tion in the CSS but there seems to be lit­tle to no use. 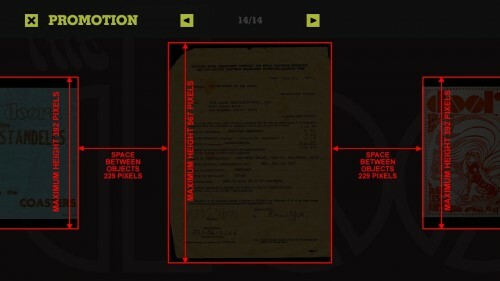 Most text, even long pas­sages of lyrics, is rep­re­sented visu­ally with a PNG file. I won­der if they orig­i­nally intended to use font replace­ment for all text, but changed their mind. Here is an exam­ple the lead me to the above con­clu­sion which I found in The Doors pack­age. 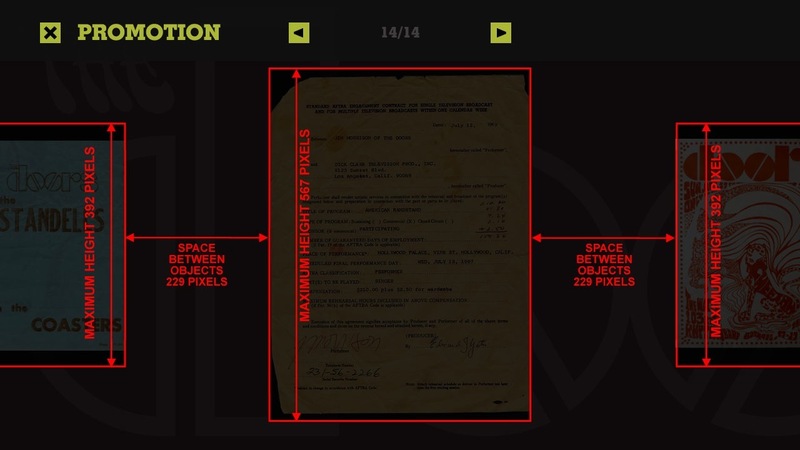 The orig­i­nal file was named “song13BackgroundClean.jpg”, but the one used is “song13Background.jpg”. 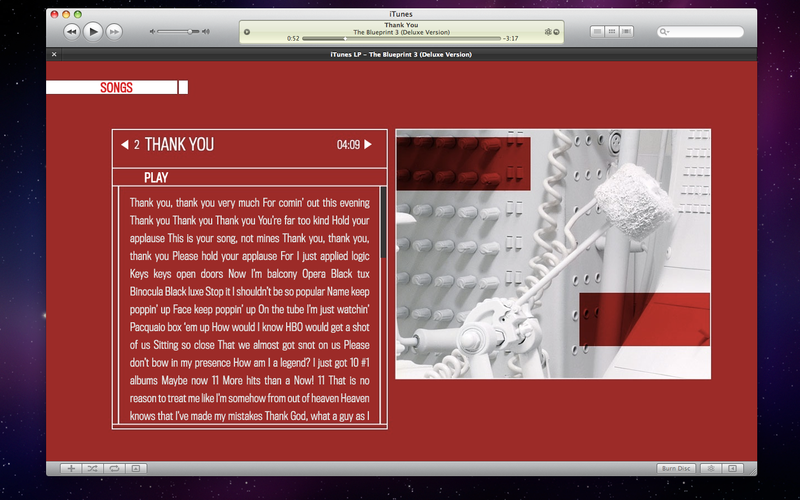 I didn’t find much in the way of DRM on the iTunes LP. Though your iTunes Store Account is recorded inside the .PLIST file, every­thing worked even when de-authorizing my com­puter in the mid­dle of play, as well as remov­ing the ref­er­ence all together. I would like to see if it would be pos­si­ble to roll your own iTunes LP by mod­i­fy­ing the included .PLIST to point to dif­fer­ent sound files. The visu­al­izer is a fun way to watch your music. And impres­sive; a friend of mine asked, “Is that Flash?” I may learn a thing or two about CSS ani­ma­tion by div­ing into the code and I encour­age you to as well. Here’s hop­ing that square blue badge shows up in the iTunes Store a lot more in the future. iTunes LPs are a really fun way to enjoy your favorite albums. P.s. To make a Smart Playlist of all your iTunes LPs, con­fig­ure so that “Kind” con­tains “iTunes LP”. I’ve included this because it took me a while to dis­cover what cri­te­ria worked, and I thought I’d save you some time. Jay Robinson is a software designer living in Palo Alto, California. Follow him on Twitter.